Soak dry Brazilian mushroom and seaweed. Cut vegetarian meat ball in half. Cut carrots into equal chunks. 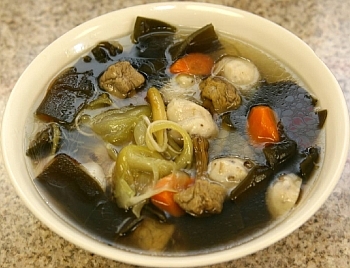 In boiling water add ginger slices, carrots, vegetarian meat balls, and Brazilian mushrooms. Allow to simmer for 30 minutes. Add seaweed, salt, sugar and Hondashi. Stir and bring to boil. Add night-blooming cereus. Bring to boil and serve.